Last night, John W.'s friday group (sans John W.) began playing Pathfinder, but the table was pretty full and two players didn't have characters. Both players asked about playing Elder Signs (which they'd learned to play earlier in the week), so I opted to join them to make the table a bit more manageable for the Pathfinder GM. The result? Both tables had a blast! And best of all, I learned a new board game (I hate reading board game rules), and a Cthulhu Mythos inspired board game at that. I'm a big fan of cooperative games and Elder Signs is squarely in that category. It's quick to play (under an hour when your still new to the game) and easy to learn. I even think my lovely wife might enjoy it, as the dice mechanic is similar to yahtzee. 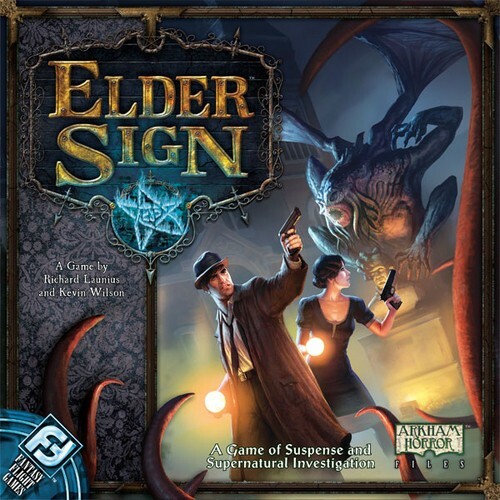 I can't recommend the game enough, even if your not a huge Mythos fan, but like a cooperative game with elements of exploration, magic, adventuring and horror. I chose to play Dexter Drake, Magician and truly dug it. I hope you get a chance to give it a try!